Dental Health Professionals is pleased to introduce Dr. Carson Shell as the newest member of their team. He is originally from Onsted, Michigan. Dr. 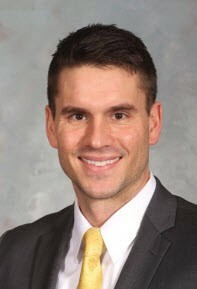 Shell graduated from Onsted High School in 2007, and continued his education at Eastern Michigan University, where he received his Bachelors of Science degree. He earned his Doctor of Dental Surgery degree from the University of Michigan. Dr. Shell is a member of the American Dental Association and the Michigan Dental Association. Dr. Shell and his wife Courtnee, along with their son Layn, have relocated to Cadillac. They look forward to enjoying this community and all it has to offer. In his free time, Dr. Shell enjoys the outdoors, recreational sports, traveling, exercising and spending time with his family.